Gift cards are a super popular gift for Christmas giving! Many retailers will have a bonus offers for gift card purchases. The Ultimate Dining Card is accepted at Cara Group restaurants including Harveys, East Side Marios, Swiss Chalet, Montana's, Milestones, Bier Markt, Pubs, Kelsey's, The Landing Group and more. 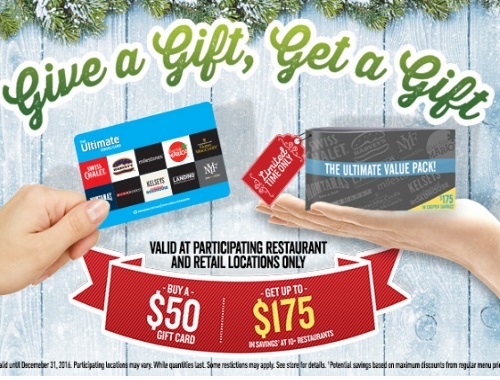 The Ultimate Dining Card makes a great gift and when you buy a $50 Ultimate Dining Card as a gift you will also get up to $175 in savings coupons for 10+ restaurants for yourself (or to gift too if you wish!). Offer is valid until December 31 2016.